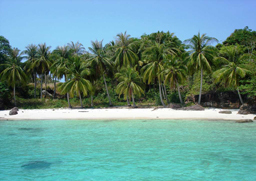 If ever you wondered where Vietnam’s paradise beach is located, then Phu Quoc island is where you should be headed for your holiday. 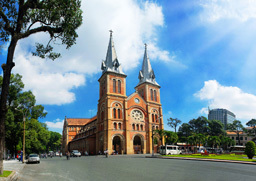 It is not only the perfect destination for a leisurely beach vacation, but also popular with weekenders from Ho Chi Minh City. Besides relaxing on the white sandy beach, you can explore the villages to get a glimpse of local life or see how the world-famous Phu Quoc fish sauce is made in factories dotted around this peaceful island. 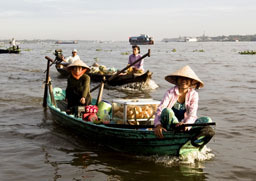 Upon arrival in Ho Chi Minh City, you will be welcomed by our guide and brought to your hotel. The rest of the day is free for your own exploration. Overnight in Ho Chi Minh city. In the morning you will be brought to the airport for your flight to Phu Quoc. Our guide will meet you and bring you to your hotel for check-in. Free time at your own leisure for relaxation & private moments. Overnight in Phu Quoc. Today you are totally free for relaxation at your resort or swimming on the beach. You are free until transfer to Can Tho and head to your hotel for check-in. Overnight in Can Tho. At 7:00am you will take a boat trip through the winding waterways of Cai Rang floating market, the biggest and busiest floating market in the Mekong Delta. This is the best time to visit the market as it is crowded with hundreds of sampans that offer fresh fruit, vegetables, plants, food and other goods for trade. This is the perfect opportunity to take photos, communicate with locals and taste exotic fruit. Leave the market and return to Saigon. 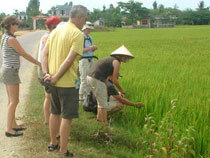 On the way back, stop at Binh Thuy old house about 5kms from Can Tho city, and Khmer pagoda. Continue to Saigon for the night. The day is yours for a last bit of shopping until heading to the airport for your flight. Asiatica Travel’s services end here. 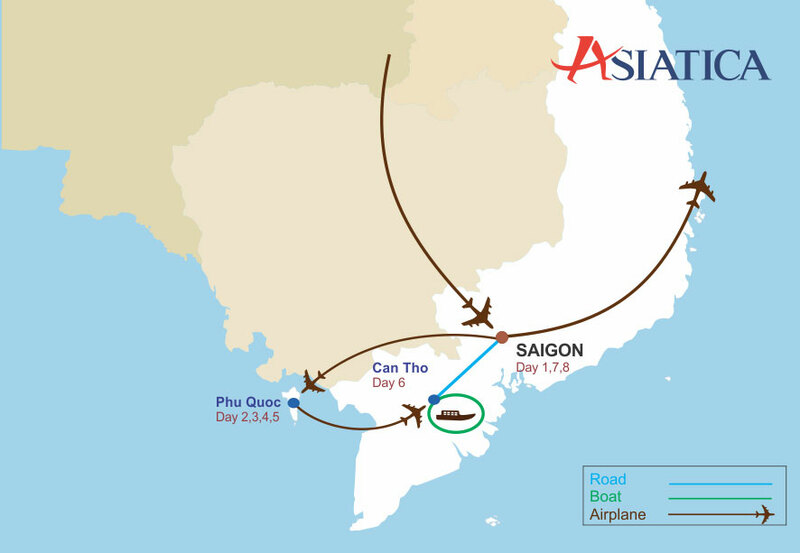 route to Me Kong Delta (Can Tho).